Posted by misscraftyfingers in Cooking, Recipe. 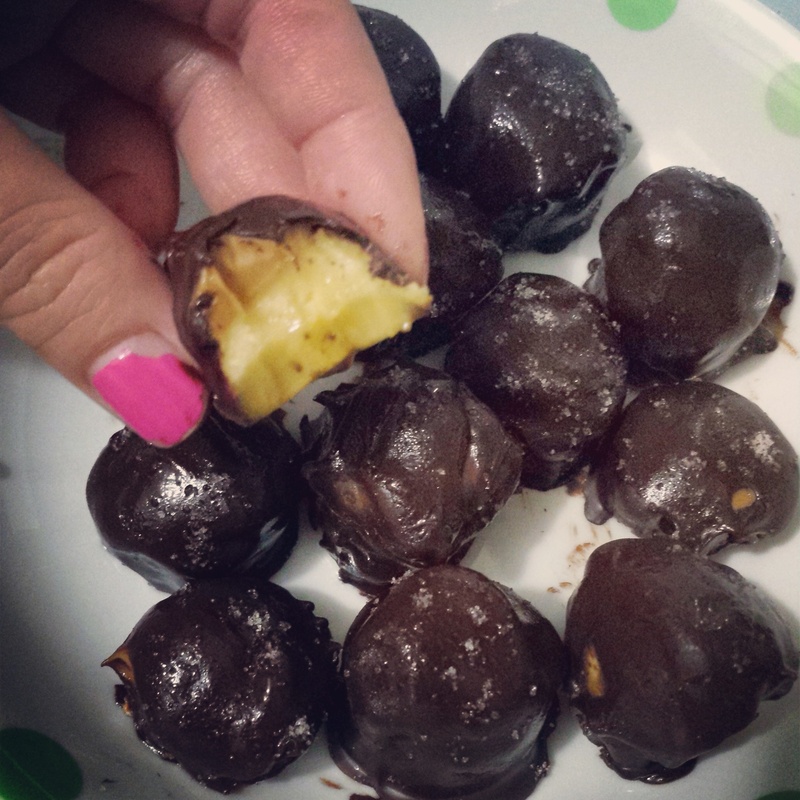 Inspired by this, I made these easy peasy Salted Banana Peanut Butter Chocolate Treats! 1. Slice bananas into 1.5 cm thickness. 2. Scoop and top 1 side of each banana slice with some peanut butter. 3. Lay on a plate / container and put into freezer until peanut butter hardens. 4. Melt chocolate with vegetable oil or milk. 5. Place each piece of peanut buttered banana on a fork. 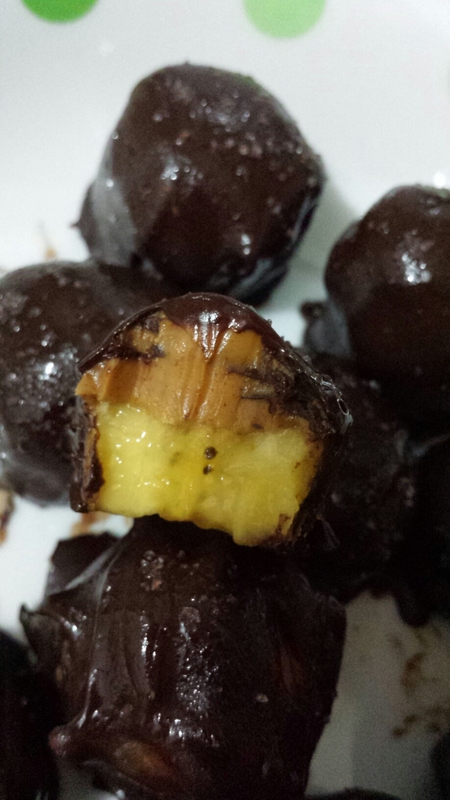 Drizzle the melted chocolate over until chocolate covers the peanut buttered banana. 6. Lay the chocolate covered peanut butter onto waxed paper on a cookie sheet or plate. 7. Sprinkle some salt over each chocolate covered piece and put them all back into the freezer. 8. Take it out when it’s nicely hardened and cold. Pop into mouth and enjoy the yummies! 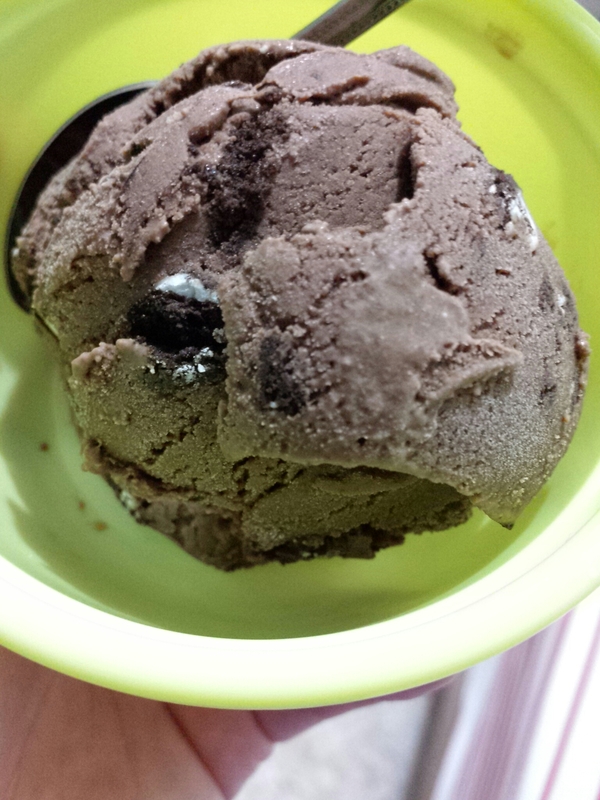 I improvised an ice cream recipe yesterday! I think it’s pretty darn tasty! 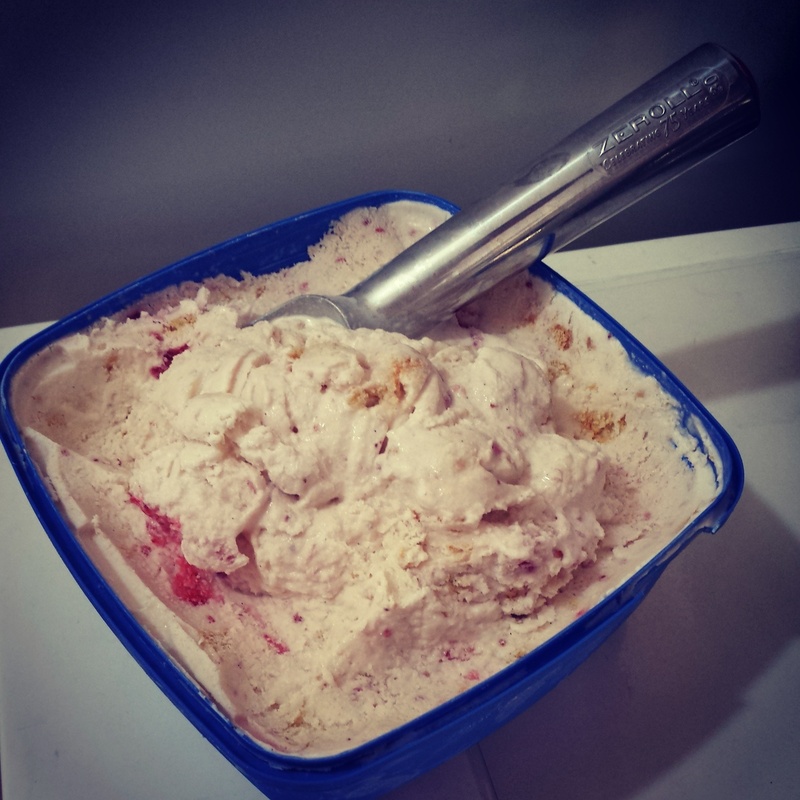 Presenting to you, my Vanilla Strawberry Ripple Ice Cream with Shortbread Crumbles! – Put cream, milk, sugar and vanilla seeds and pod into a pot. Simmer until sugar melts, do not boil. Turn off fire and add vanilla essence. Stir evenly. – Cool mixture to room temperature before chilling overnight. You can leave the vanilla pod in this mixture to chill overnight. Remove pod before putting into ice cream maker. – In a separate small pot, simmer the strawberries with sugar until strawberries ate soft. Puree the strawberries with a blender. I used a hand blender. Chill in refrigerator. – Churn the chilled cream mixture in your ice cream maker according to your machine’s instructions. – Add the shortbread crumbles at the last couple of minutes of churning the ice cream. Mine took about 30 minutes. – Pour the churned ice cream (it’ll look like soft serve ice cream at this stafe) into a container suitable for freezing. 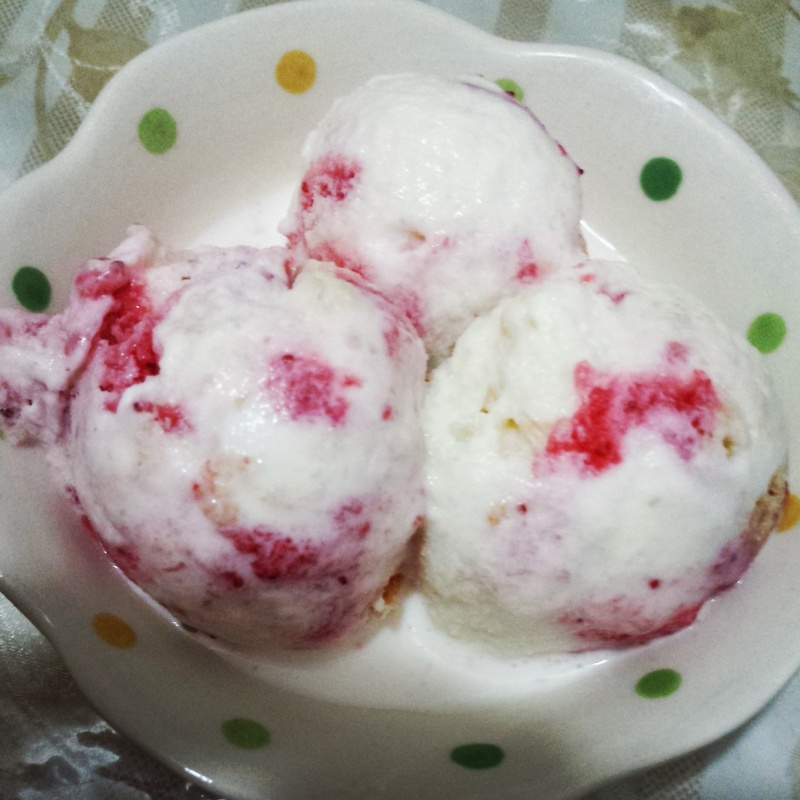 – Stir in the strawberry puree into the ice cream gently for the ripple effect. – Freeze for at least 3 hours before serving. Posted by misscraftyfingers in Baking, Cooking, Recipe. Recently, I bought a really cheap breadmaker online for only S$80 and since then, I’ve baked 3 loaves with it. First one was a basic white bread. Second one was a whole meal bread. And I just baked the latest one! It was an experimental bake and turned out really yummy! 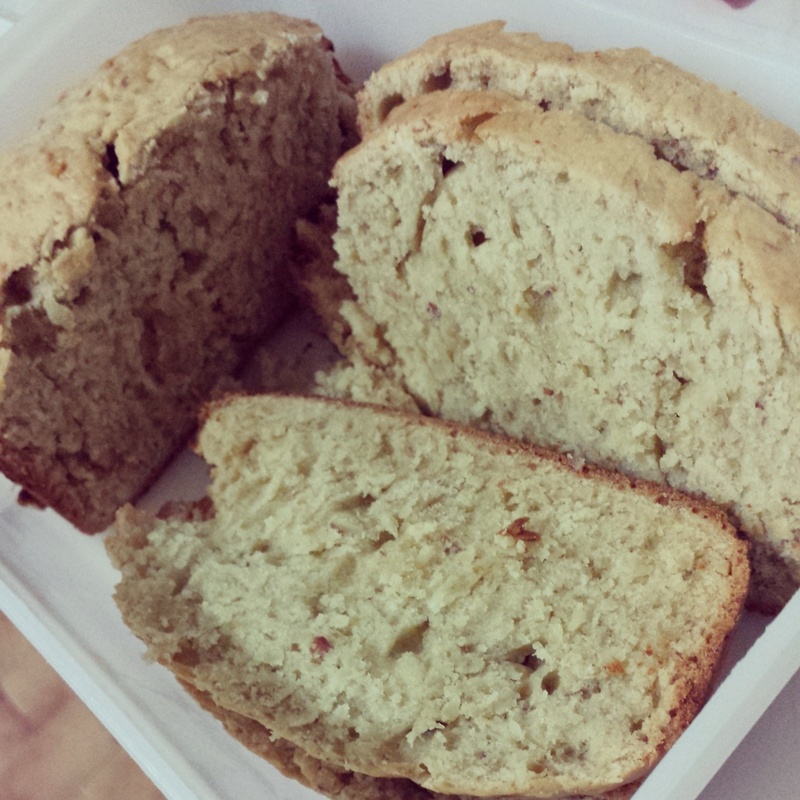 So, let me present to you, my BANANA ALMOND BREAD! I decided to write down the recipe because I’ll definitely make it again. So I’m sharing the recipe with you too! Put all the ingredients into the bread maker. Select dough function and let the machine mix the ingredients for around 5 to 7 mins. * I removed the paddle before baking. It can be a little messy. 😛 but it’ll prevent the loaf from having a big hole at the bottom. Switch to bake function and bake on medium for 40mins. Switch to dark for 15mins or until top looks browned. That’s it! Let me know if you try the recipe!